Summer Lovin >> Tomatoes. 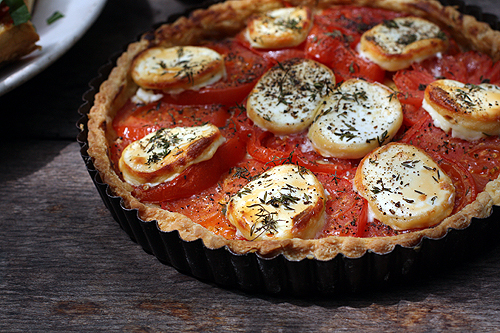 Tomatoes in a tart shell with herbs and goat cheese. This week, I’ve been freaking out with excitement over my two new (birthday present) kitchen gadgets: a Cuisinart food processor, and a Kitchenaid stand mixer. Oh my gosh even writing that sentence, proclaiming myself as the owner of these two things, makes me feel giddy. I feel like my kitchen (and thus moi) just went through a major rite of passage. I daydream about the ease and speed with which I will now be able to make dough, pesto (no more mortar and pestle! 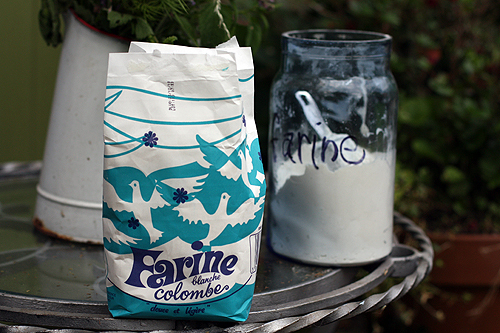 ), fluffy whipped cream, perfectly smooth crepe batter, etc. I imagine myself flitting around the kitchen in a cute apron doing other things, like making flower arrangements, while the machine works for me. Even though I am generally cooking in sweaty running clothes topped by my dad’s old oxford shirts, rather than a skirt and apron, and making a huge mess all the while.. not nearly so chic. But that’s why this is the daydream version. ANYWAY, sorry, that is mostly irrelevant, except to explain why I was so excited to find this tomato tart recipe from the estimable David Lebovitz. Well for one thing, I almost had a fit over how delicious the roasted tomatoes were that I made earlier this week for my pesto pasta and urgently wanted more things to do with the wonderful summer tomatoes, but for another, it gives me an excuse to use the food processor (for the tart shell)! 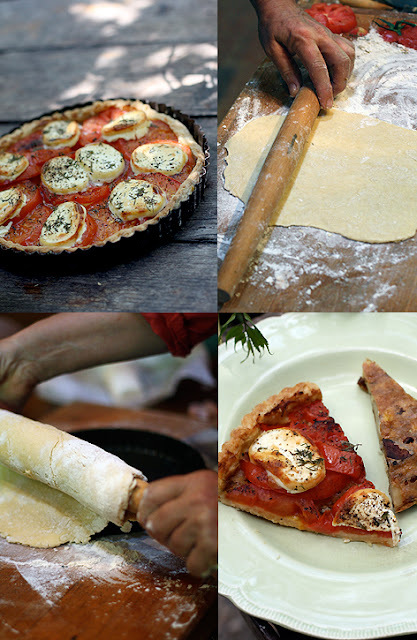 It is simply a tart shell, tomatoes, herbs, and goat cheese. YUUMMM. It is basically a big party to show off the tomatoes. Also, if you read David’s blog entry about making this with his friends in France, it all sounds so charming that you practically have to make it, just to try to relive some of that wonderment. I’m going to serve this with rose over ice, just so I can try to recapture his experience. No I’m not kidding. Recipe and story on David’s blog here.